I took this pic of a Red-breasted Nuthatch on a very cold day a few weeks ago. 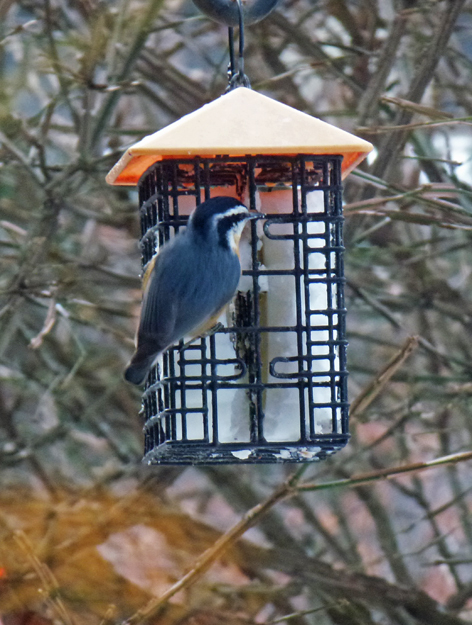 The suet seemed to be just what it needed for a bit of energy to fight the cold. I have seed and suet out for the birds, and I am seeing a lot of birds on the suet feeder this Winter. Even the Cardinals, who I had thought were just seed-eaters, are visiting the suet. Hello, I miss the Red-breasted Nuthatches. I have not seen one in my yard in a long time. They are so cute, great birdie visitor! Thank you for linking up and sharing your post. Happy Saturday, enjoy your day and weekend! What a pretty little bird. You've reminded me how much I miss the birds I used to see in my back yard at the old house. The birds love the home made suet around here. Lovely photo. ...I hope that you are staying warm. Your dinner guest certainly must appreciate the meal. Clear photo with good detail on the Nuthatch. We have a lot of nuts down here, but I'm not sure about nuthatches. Pretty bird, though. I've often wondered how they survive below zero cold? They're quite grateful for the feeders. A quick bite to re energize. Nice pic, Pat! Lovely photo of the nuthatch! You have a lot of interesting birds visiting in winter. Snacks are the best! Especially during the winter for them. Ours have been frantically feeding. Great TV for the cats!